Charles Arntzen is convinced that the reddish, powdery substance he holds in his hand will make the world a safer place. Arntzen, an Arizona State University biologist, has been working for nearly five years to create what is basically freeze-dried tomato juice  but not from any ordinary tomatoes. This fruit (yes, tomatoes are fruits, not vegetables) carries a gene from a strain of the E. coli bacterium. Some strains of E. coli can cause violent diarrhea and death. Swigged down in reconstituted juice, however, a protein made by the E. coli gene should act as a vaccine, priming the immune system to recognize and fight off the real thing. What's the advantage? Conventional vaccines are costly to make and distribute in the impoverished Third World countries that need them most. That's why Arntzen and others began thinking about using plants instead of needles, creating vaccines that would be easy to grow locally in, say, Vietnam or Bangladesh. He focused on diarrhea, because, says Arntzen, "diarrheal diseases kill at least 2 million people in the world every year, most of them children." And he chose tomatoes because greenhouse-grown tomatoes can't easily pass their altered genes to other crops and because tomato-processing equipment is relatively cheap. It would be easier still just to take whole tomatoes and eat them, but that could be a disaster, says Arntzen. Individual tomatoes come in different sizes with varying levels of protein, and uniformity of dosage is key to an effective vaccine. "I'll always regret calling these edible vaccines,'" he says, "because that's just the image it conjures up." Arntzen hopes to test his tomato juice on animals within the year, with human trials to follow. He's also thinking about vaccines for cholera, hepatitis, human papilloma virus and measles. 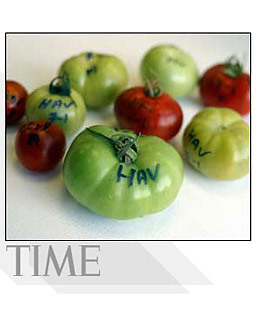 And he's not alone: some four dozen labs around the world are working on their own versions of what Arntzen would prefer to call "plant-derived" vaccines, based on tomatoes, bananas and potatoes. Within a few years, some of the planet's most pernicious killers could be in retreat  and it won't hurt a bit.